This weekend's explosively energetic performance will leave you wanting to dance. The atmosphere is electric inside the studios of Dallas Black Dance Theatre. Booming drums echo through the space as dancers weave in and out of intricate formations. One man hurdles over four of his co-stars as they crouch low. Meanwhile, a pair of women launch themselves off the backs of two other women, flying into the air with ease. More than a dozen dancers bristle with excitement as they throw themselves into dizzyingly fast combinations of sissones. They stomp and shout along to the beat. This was the scene that greeted me as I watched Dallas Black Dance Theatre and DBDT: Encore!, its second company, rehearse for their upcoming performance of DanceAfrica. The dancers moved like a whirlwind, with near-impossible speed. The noise of the drums was overwhelming, and the dancers added to the din as they waited in the wings, clapping and stomping for their fellow performers. Their enthusiasm was contagious – I wanted to whip off my shoes and join them on the floor. Nycole Ray, the director of DBDT: Encore!, and one of the choreographers of this piece, stood at the front, beating a drum with a stick and giving directions. Nycole Ray has been with Dallas Black Dance Theatre for 21 years. She graduated from California Studio of the Arts with a BFA and attended London Contemporary Dance School in England. Ray carries herself with the confidence and grace of a dancer, and her energy is compelling. “Balante,” the piece the dancers were rehearsing, was originally choreographed by Dr. Chuck Davis, the founder of DanceAfrica, and Ray added her own choreography to it. She worked with Davis when he first staged this piece in 2016. “I really wanted to stay true to what I knew he liked in terms of when I started to add on to it,” says Ray. “Baba” Chuck, as his dancers affectionately called him, was a legend in dance who passed away in 2017. Standing at 6’8, he was a huge man with what Ray described as a gentle soul. The renowned dancer was famous for leading the spread of traditional African dance in America. 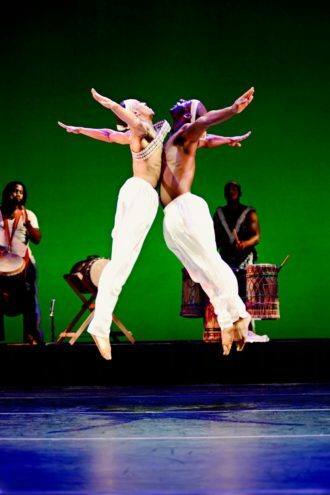 He founded DanceAfrica at the Brooklyn Academy of Arts, and helped bring the performance to other cities as well. “He was like the face, the host of everything,” says Ray. As Ray began adding onto the choreography, she wanted to channel Baba Chuck. She made every new step more daring, pushing each dancer to the limit of their abilities. That’s what makes this performance such a dream to watch. Every moment is calculated, with one group of dancers showing off leaps and handstands, while another does high kicks and stomps impossibly fast, until finally it culminates with more than 20 dancers jumping gracefully in unison. Bianca Melidor, a recent graduate of Point Park University and one of the newest dancers with DBDT: Encore!, found that the most challenging part of the piece is the stamina that it requires. As a new dancer with the second company of DBDT, Melidor was surprised by how supportive the dancers in Dallas Black Dance Theatre were. In the intensely competitive world of professional dance, the failure of your peer can be your chance for success. Luckily, DBDT doesn’t have the stereotypical Black Swan environment. “We’re all in it together. If we have one weak link, we’re all weak. So, we have to work together and help each other,” says Ray. Melidor echoes this sentiment. On the first day that the two companies danced together, she found that the first company wanted to support Encore! in the same way that Encore! supports them. “That’s the best part about dancing with them. And also, not only being their friends and their siblings, their brothers and sisters, but also kind of being their mentees and watching them do what they do, because they’re so seasoned and so experienced. How they perform using their facial expressions, how they express their emotions through their movement—it’s very inspiring for me to watch,” Melidor says. The whole studio has that family atmosphere. The group shouts approval from the side when two dancers nail a particularly difficult handstand. They smile at each other from the wings and pat each other on the back when they exit the stage. When Melidor and her partner execute a trying sequence of jumps and kicks with sky-high extensions, both companies applaud them. Having that nurturing environment makes a tricky piece like “Balante” much easier. This show also brings in guest artists from Step Afrika!, a dance company based out of Washington D.C. This is their first time performing in Dallas. Step Afrika! 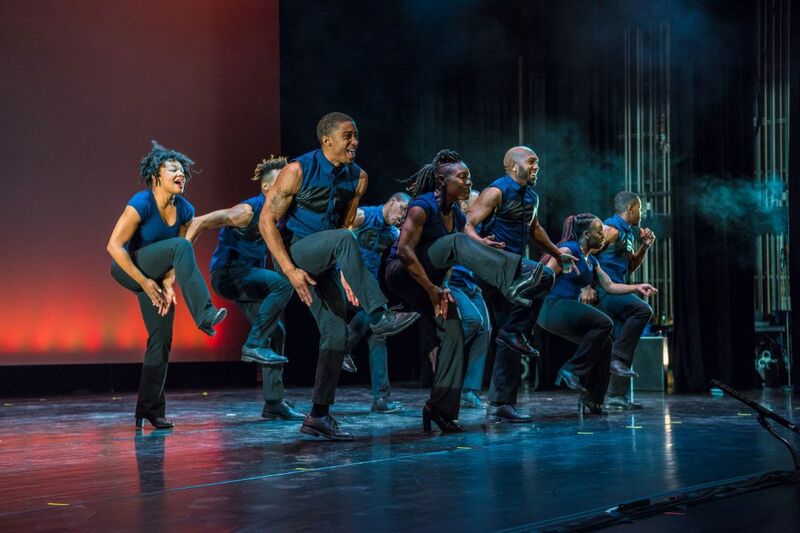 brings together the evolution of South African dance, from its origins to what became American stepping performed by African-American fraternities and sororities. “I’m hoping that the audience will walk away with more knowledge, but also excited about what they just saw and want to learn more about that culture and any culture,” Ray says. Chuck Davis held the mantra “‘peace, love, and respect for everybody.” That’s one of the things that Ray and Melidor hope audiences will take away from seeing DanceAfrica. Watch DanceAfrica this weekend at the Moody Performance Hall on October 5-6 at 7:30 p.m. I promise you’ll leave wanting to dance.